March 16, 2011- The International Air Transport Association (IATA) praised President Dilma Rousseff’s strategic focus on aviation and urged a quick follow-up with critical reforms to improve the industry’s competitiveness. Preparations to host the FIFA World Cup and the Olympics make urgent progress necessary. Dilma Vana Rousseff is the 36th and current President of Brazil. She is the first woman to hold the office. Prior to that, in 2005, she also was the first woman to become Chief of Staff of Brazil, appointed by then President Luiz Inácio Lula da Silva. 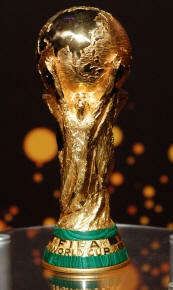 The FIFA World Cup (also called the Football World Cup, the Soccer World Cup, or simply the World Cup) is an international association football competition contested by the senior men's national teams of the members of Fédération Internationale de Football Association (FIFA), the sport's global governing body. The championship has been awarded every four years since the inaugural tournament in 1930, except in 1942 and 1946 when it was not held because of the Second World War. The current champions are Spain, who won the 2010 tournament. Brazil will host the game in 2014. “President Rousseff recognized the power of air transport to drive long-term gains in the quality of life in Brazil in her inauguration speech. Her intention to create a ministry-level Civil Aviation Secretariat is an opportunity to achieve change,” said Giovanni Bisignani, IATA’s Director General and CEO. Infrastructure and Regulatory Framework: “The INFRAERO model, which controls 94% of Brazil’s airports, is broken. Terminals at 13 of the top 20 airports cannot cope with current demand. Sao Paulo, which handles 25% of Brazil’s traffic, is in a critical state with insufficient capacity and services that do not meet global standards. Concessions could be a way forward. But they must be accompanied by transparent, robust and independent economic regulation supported by effective industry consultations,” said Bisignani. IATA supports ANAC’s continued role in overseeing airports. “ANAC’s proposed high level framework for airport regulation is mostly in line with IATA’s recommendation and ICAO’s principles. But four important changes are critical to shore-up Brazil’s competitiveness. First, ATAERO must be abolished. This 50% surcharge on fees contravenes ICAO principles. “Second, we need greater transparency and assurances that there will be no cross-subsidization among airports. Third, the solution to insufficient capacity must not be peak hour pricing. Efficiency gains and infrastructure development are the way forward. And finally, the 70% increases for international carriers as a result of a fee recalculation are not acceptable. Charges must come down, not go up. If these four issues are not resolved, the benefits of concessions will be lost,” said Bisignani. Fuel Pricing: Brazil must follow-up on the 2009 elimination of the $100 million PIS/COFINS fuel tax by addressing the Petrobras import parity pricing policy. A recent study concluded that Petrobras is over-pricing jet fuel by $400 million annually. “There is no justification that Brazil’s jet fuel prices should be 14% more expensive than in the rest of the region. Brazil produces 80% of its fuel needs from its own refineries. It makes no sense to peg prices to the Houston market and include all theoretical costs for importation—including transport. It is destroying the competitiveness of Brazilian aviation,” said Bisignani. Globally, fuel averages at 29% of an airline’s operating cost but for Brazil’s airlines, it is 37%. Air Traffic Management: IATA urges Federal Government support for DECEA’s improvement efforts. “Airlines have invested in avionics to support more efficient flying. But the infrastructure on the ground, does not match our capabilities in the air,” said Bisignani. Specifically, IATA is encouraging the implementation of more efficient operating procedures, known as RNAV and PBN, to increase capacity and efficiency in both Sao Paulo and Rio. Moreover, IATA is encouraging the Department of Airspace Control (DECEA) to adopt a process for continuous improvement based on analysis of performance data against agreed performance targets. Environment: Aviation is united and committed to improving fuel efficiency by 1.5% annually to 2020, capping net carbon emissions from 2020 with carbon neutral growth, and cutting net emission in half by 2050 (compared to 2005). Governments, through ICAO, have agreed to find a global approach on economic measures related to CO2 emissions. “Aviation is the only global industry with a global plan—by industry and by governments. Brazil must support the global approach. That means stopping plans by Guarulhos City to impose environmental taxes that are counter-productive to global efforts. And the Government should follow-up on the leadership of TAM’s sustainable biofuels test flight by creating the fiscal and legal framework to support a sustainable Brazilian biofuels industry,” said Bisignani. FIFA World Cup and the Olympics: “Brazil’s airports will not be capable of successfully hosting the FIFA World Cup or the Olympics without major changes. Time is running out for major infrastructure projects. We are concerned that Sao Paulo’s Terminal 3 is being planned without industry consultation. Whatever is achieved, we will need to make the current infrastructure work much harder with better processes. “One simple solution is for all airport stakeholders—ANAC, INFRAERO, customs, immigration, public health and agriculture—to institutionalize cooperation. Airlines could bring solutions to improve terminal operations and reduce congestion, including IATA’s Fast Travel standards for implementing self-service technology, and e-freight to improve cargo handling efficiency. These solutions exist today and can deliver major improvements,” said Bisignani. IATA also encouraged ANAC to add a new dimension to its safety oversight by adopting the IATA Operational Safety Audit as a requirement for all airlines operating to Brazil. Aviation is important to Brazil’s economy. It drives travel and tourism which supports 9.1% of GDP and over 8 million Brazilian jobs. Aviation has grown by an impressive 10% annually since 2003. The Brazilian domestic market is the fourth largest in the world after the United States, China and Japan. But with 13 million international passengers it ranks 37th, completely disproportionate to Brazil’s economy which is the world’s eighth largest. IATA has had a Brazilian office since 1991. IATA’s Brazil office processed about $4.5 billion in industry settlements in 2010 and provides a local access to all of IATA’s global expertise including safety, security, infrastructure development and Simplifying the Business. In December 2010, IATA appointed Carlos Ebner, former Chief Financial Officer of Varig and CEO of OceanAir, as Country Director for Brazil.